The all-star game marks a crucial part of the season where teams are starting to form into groups that are likely to make the playoffs (i.e. Denver and Ohio), those that are out (Boston), and then the rest of the league. Denver reclaimed the number one spot they have held longer than anyone else has this season with a win and an Ohio loss to New York. Ohio dropped to the number two spot and remains just half a game behind the Denver and barring total meltdowns, the top two teams appeared poised to cruise into the playoffs. Florida and Charlotte are 2.5 games out of first place and trail Denver and Ohio. Chesapeake and New York gained ground on the top four with their wins this weekend and are only three games behind first place Denver. Atlanta split their games this week and moved out last place. This past week placed the Blaze in a tie with Rochester at 3.5 games back after the Rattlers lost to the Lizards and the Bayhawks. Boston occupies last place and looks to be out of playoff contention, but have picked up Garret Thul in an effort to shake up their line-up even more. This most recent slate of games has seen some of the widest margins of victory as teams are looking to increase point totals and margins of victory and sweep as many opponents as possible. Memories of last seasons’ playoff spots decided by the tie-breaker system remain fresh in many players and coaches’ minds. After the all-star games’ camaraderie and festivities look for higher margins of victory as no one wants a repeat of last season. The new-look New York Lizards defeated the Ohio Machine and kept their playoffs hopes alive and helped drop the Machine out of first place. In what was a homecoming for many Ohio players, the first quarter ended in a 2-2 tie. The score remained close at the half as New York led 6-5. Ohio looked primed to take over the game in the third quarter as they took the lead 11-10. The fourth quarter proved just as tight until New York put out a three goal run at the end, including a 2-point goal. The freshly traded Will Manny led his new team with five goals to earn him offensive player of the week honours. In addition to Manny, Joe LoCascio scored three times for his new team, one of which was a 2-point game winning goal. The trade of the season has worked out in New York’s favour so far. Tom Schreiber led Ohio with four goals and Jake Bernhardt followed him with three. Greg Gurenlian and Jon Garino combined to go 20-32 on face-offs to tilt the balance to New York. Drew Adams made 18 saves to Kyle Bernlohr’s 15 saves to earn the win. Next: The Lizards face a crucial battle against the Blaze as the new kids look to make up some ground after the Fourth of July loss against the Outlaws. Ohio looks to knock off Denver and take back the number one spot. Atlanta kept building on their momentum as they grounded the Launch to put Florida in a tie with Charlotte 2.5 games out of first. The trend of rain delays at Fifth Third Bank Stadium continued during this game and worked in favour of the home team. Atlanta lead 4-3 at the end of the first quarter, and in a low scoring second quarter extended their lead to 6-3. That wasn’t even Florida’s only scoreless quarter of the game and it was costly. The Blaze outscored the Launch 5-1 to take an 11-4 lead at the end of the third. The spectre of scoreless quarters again reared its head in the fourth as Atlanta scored six goals in the final quarter, including a 2-point goal on an empty net. Offensively, Kevin Rice and Mark Mathews led the Blaze in scoring with five and three goals respectively. Rookies Tim Edwards, Nick Mariano, Alec Tulett and veteran Chazz Woodson each scored for the Launch. Atlanta went 15-23 on face-offs as rookie Jake Withers took the majority of the draws with newly activated Jeremy Thompson spelling the rookie. Austin Kaut continued his all-star level of play as he made 17 saves, but Adam Ghitelman got the win, making 12 saves. Next: Atlanta looks to take down the Lizards and scale over them to a playoff spot while Florida takes on the Bayhawks and looks to retire Casey Powell’s jersey with a win and stay in playoff contention. Rochester jumped out to a 5-3 first quarter lead against Chesapeake, but the Bayhawks turned the tables on the Rattlers and took an 8-7 lead at halftime. Chesapeake’s offense continued gaining momentum as they took a 13-9 lead at the end of the third while the Rattlers again only mustered two goals. Chesapeake reeled off five goals, one of which was a two-pointer, as Rochester went scoreless. Lyle Thompson scored five goals to lead the Bayhawks and Matt Abbott followed close behind with four goals. Thompson transitioned from indoor to field as well as a new team seamlessly. Jordan MacIntosh led the Rattlers with a hat trick in one of their lowest offensive outputs of the season. Rochester got the best of the face-off battle 19-31 with Drew Simoneau taking almost all the draws for the Rattlers. Both teams had their keepers split time during the game. John Galloway made nine saves while Blaze Riordan made two for the Rattlers. Niko Amato made five saves and Brian Phipps made one for the Bayhawks. Next: Chesapeake looks cancel Florida’s playoff launch and the Rattlers look for a win against the new look Cannons who are looking to play spoiler for the rest of the season. Denver didn’t make their fans wait for fireworks during their Mile High Fourth of July game as they went big and doubled-up Atlanta to reclaim first place in the league’s highest scoring game of the year. Atlanta was looking to make a game of it after coming off a dismantling of the Florida Launch but instead found themselves down 6-4 at the end of the first. The Outlaws exploded for nine goals as they led 15-6 at halftime. 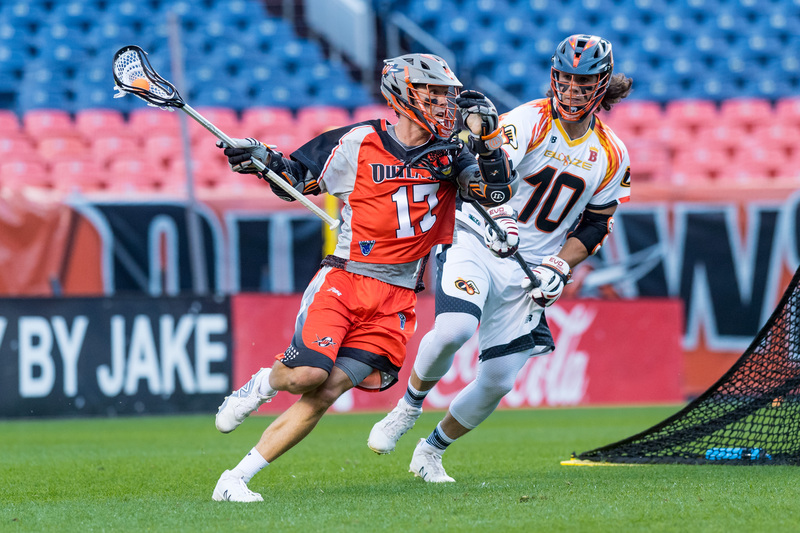 Atlanta tried to make a run, but could only narrow the gap to 17-9 at the end of the third despite an Outlaws’s dry-spell: Denver’s only goal in the third was by goalie Jack Kelly who scored on a full-field shot, surprising Adam Ghitelman who had given up on the play with just seconds left in quarter. The Outlaws continued their dominance into the fourth, doubling up the Blaze in the fourth quarter and the game. The Outlaws dominance even extended to the X as they went 25-37 on face-offs. Despite giving up the goalie goal, Adam Ghitelman made 19 saves for Atlanta while his counterpart for Denver, Jack Kelly, made seven. B.J. Grill earned defensive player of the week honours as the Outlaws held James Pannell scoreless for the first time all season. Mike Bocklet led the Outlaws with six goals. Over 26,000 fans in attendance then enjoyed an awe-inspiring fireworks show to commemorate the holiday. Next: Denver tangles with Ohio while Atlanta looks to scale New York.